Award-winning music sensation, Tiwa Savage, has entered the second quarter of the year in grand style, as she got for herself a customised exotic car. The ‘Tiwa’s Vibes’ crooner took to her Instagram stories on Friday to share a photo and series of videos of the latest addition to her garage. 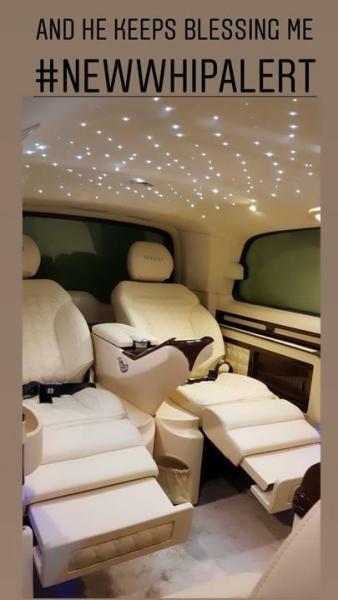 Although she was not explicit on the brand of automobile, it has “Tiwa Savage” clearly inscribed on the seats which suggests how expensive the yet- to–be- identified ride would cost. Savage, mother of one , who got separated from her hubby Tee Bilz, in 2018, came to limelight with the signing of recording contract with Mavin Records in 2012. She also signed a management and publishing deal with Jay Z’s Roc Nation in 2016, which she later confirmed via Instagram. Savage was featured on Solar Plexus, a compilation album released by Mavin Records. Her debut studio album, `Once Upon a Time,’ was released on July 3, 2013. It was supported by the singles “Kele Kele Love’’, “Love Me (3x)”, “Without My Heart”, “Ife Wa Gbona”, “Folarin”, “Olorun Mi” and “Eminado’’. Savage’s second studio album, `R. E. D’, was released on December 19, 2015. She is a recipient of many awards including, MTV Africa Music Award, The Headies Awards, Channel O Music Award, Nigeria Music Video Award, and City Peple Entertainment Awards, among others. In 2018, ace music superstar, Wizkid featured her in the video for his acclaimed song ‘Fever’, in ‘intimate scenes’ which further fuelled fans’ speculations of relationship between them.